LET’S begin with Paul Durcan. Genuine GAA folk reading this column can skip the next couple of paragraphs as they don’t apply to you – Hurler is writing them in the off-chance that one or two of the amadáns lambasting Durcan since Sunday’s All-Ireland Final might be reading this. Had it not been for Paul Durcan’s immense contribution to the Donegal cause in the Jim McGuinness-era, chances are those castigating him now would never have experienced the big days this Donegal team have provided us in Croke Park and elsewhere around the country in recent years. The big Four Masters man has been absolutely superb between the posts for Donegal – indeed, superb doesn’t do him justice. In 24 championship matches played under Jim McGuinness, Durcan has kept a clean sheet in 16. It’s fair to say we wouldn’t have been in this All-Ireland Final had it not been for Papa. He made an outstanding save look deceptively simple 25 minutes into the semi-final against Dublin three weeks ago when Diarmuid Connolly jinked inside the Donegal defence and unleashed a goal-bound daisy-cutter. Had Connolly found the net the scoreboard would have read 1-8 to 0-4 and most likely left Donegal with no way back. Durcan’s exquisite leg block was a near carbon-copy of the exceptional save he made from a Martin Penrose snapshot 70 minutes into the Ulster semi-final two years ago. That pivotal save was one of the landmark moments of Donegal’s All-Ireland winning 2012 championship campaign. Enough said – leave off Durcan. IT’S not a pleasant task to have to pick over the debris of Donegal’s below-par outing, particularly when one has always viewed the protagonists from the perspective of an appreciative supporter. Suffice to say, Kieran Donaghy’s 52nd minute goal from Durcan’s short kick-out was far from the only reason we came up short on Sunday. In a sentence, we produced a performance all over the field that fell well short of what we are capable of producing nine Sundays out of ten. The game plan devised by Jim McGuinness and Paul McGonigle in advance of this game – no doubt painstakingly rehearsed and perfected over three weeks – did not come to pass on the pitch. On top of that, the individual flair – the icing on the cake in recent performances – was mostly absent throughout. The pity of it, the absolute pity of it, was that despite a below par performance this game was there for the taking. 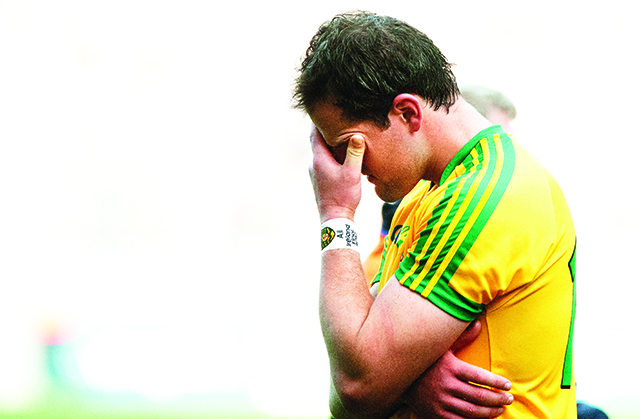 At worst, at the very death, Donegal might have snatched a draw. (Kerry did it in the drawn semi final against Mayo.) On a day when so much didn’t click into place, a draw and the opportunity to start afresh against a team who were no great shakes themselves would have been a terrific outcome. That said, Kerry deserve credit too – more specifically, Eamonn Fitzmaurice deserves a tip of the hat. Fitzmaurice paid Jim McGuinness the ultimate compliment by mimicking his defensive strategy. And it paid off in spades. Kerry operated a defensive ring of fire on Sunday that proved exceptionally difficult to break down. As an add-on, they operated it more intensely than Donegal, ruthlessly targeting anyone trying to breach it with monster rebuttals bordering on the savage – as Leo McLoone, Colm McFadden and Rory Kavanagh would undoubtedly confirm. But for all Kerry’s input into the three-point margin between the sides, Donegal were the main contributors on one of the strangest Sunday’s this writer has ever experienced in Croke Park. For starters, the atmosphere was cat. Absolutely dire. Three weeks ago, from start to finish over two games against Dublin, the vibe in Croke Park was electric. On Sunday, it was non-existent. Donegal folk, Hurler among them, seemed edgy, nervous and out-of-sorts – a mirror reflection of what was bedevilling the boys down below us. 82,184 packed into Croke Park on Sunday but Hurler has heard more noise coming out of a bingo hall. It was a black afternoon all round. The lowbrow analysis will – as discussed at the top of this column – focus on possession lightly coughed up by Odhrán Mac Niallais for the first goal and Paul Durcan for the second – but there was so much more to consider over 70 minutes. The off-the-shoulder overlap, which made Donegal so potent and dynamic in attack against the likes of Monaghan and Dublin, was completely non-existent. The players, for some reason, were more lateral in their approach play last Sunday than in any other performance this year. The transition between defence and attack, so explosive and exciting against the Dubs, seemed laboured and lethargic. Donegal were never passive, but everything they did on Sunday appeared a slog nonetheless. The result was that Kerry’s defensive ring remained largely intact, penetrated only occasionally and with limited success at that. Turnovers, the specialty of this team, were as scarce as hen’s teeth. And yet, not once but twice, they heroically clawed their way back into the game having conceded those two sucker goals. Toye, McElhinney, McBrearty and Molloy all made big impacts off the bench. Perhaps McBrearty would have had a bigger say on proceedings if introduced earlier. Jigger was most unfortunate not to have scored a real peach of a goal – he couldn’t have done much better from the angle open to him and Hurler was sorry to see him called ashore. It was only at the tail end – when there was no choice but to lob caution to the wind – that Donegal went route one, time and again charging down the throat of the Kerry defence. It paid dividends for Toye, Murphy, McBrearty and McElhinney in particular. Oh for more of it and earlier, because Kerry had no answer to it! One such glorious, heroic effort – the last of the match – led by Murphy, nearly secured a replay that would have held little fear of a repeat performance from Donegal. Only the width of the post denied them the fruits of the bravest of comebacks at the very death of it. It wasn’t to be. But the bitter truth that even the most lacklustre display of the entire campaign could have eked out, at worst, a sequel, will haunt Donegal for years to come. This was an All-Ireland we lost as opposed to one where we were beaten. ONLY a select few know what it is like to play in an All-Ireland Final, in a cauldron with 80,000 people tracking your every move, in front of television cameras broadcasting to millions. Only a select few Gaelic footballers experience the rare level of emotions that playing in an All-Ireland brings. These Donegal boys know it now as winners and losers. Anyone who has ever kicked ball, whatever the level, will appreciate how cruel and distressing it is to lose a game in circumstances where an opportunity went a begging. These boys will probably carry the hurt of last Sunday in the back of their minds for the rest of their days. They didn’t deserve that having sacrificed so much to get there – Jim McGuinness revealed in Donegal Town on Monday night that the squad had completed 128 training sessions (not counting gym work) up as far as Sunday’s final. Hurler, for one, never stopped for a moment to consider the pain Mayo must have endured in 2012 when we put them to the sword. Little wonder that someone described the atmosphere in Donegal since Sunday as being akin to a wake, for it was – something they are well used to in Mayo. Donegal were just as magnificent in defeat as they were in victory two years ago. There was something immensely noble about how they conducted their business over 70 minutes on Sunday. Events dictated that they were destined to pursue this game from the get-go and they did so with the self-respect and muster of great champions. On an afternoon when not much went right, they refused to accept the inevitable and died with their boots on – with absolute dignity. Ditto McGuinness, who cut the same impressive figure in defeat as in victory – as stately and eloquent now as the chief flag-bearer of sorrow as on that September Sunday two years ago when Sam was won for the Hills. The trauma of an All-Ireland loss diminishes them not at all. The achievements of these boys over four summers will live long in the folklore of the Hills. Was it President Kennedy who said once: “We need men who can dream of things that never were and ask ‘why not?’” Well, we got men who dared to dream and – win or lose – they have given us some of the days of our lives. Who knows what the future holds. No one but the boys and management can make the big calls that have to be made in the days, weeks and months ahead. Some of them will have to consider if they have more in the tank to give to a cause they have already given so generously to for so long. Make sure to get this weeks Inishowen Independent to find out what the Hurler has to say this week!